Fantasia's "Dance of The Hours" celebrates a great Italian opera with a ballet chorus of animals. Although Ponchielli's "Dance of The Hours" was first performed at La Scala, Milan, in 1876, it remains today a glorious example of the danse classique at the pinnacle of its full fruition. The ballet occurs in the third act of the opera La Gioconda (The Smiling One) as the Duke Alvise entertains his guests with a divertissement in the grand ballroom of the palace. The distinctive choreography, so charmingly baroque, yet at the same time so daringly conventional, is permeated with the true spirit of the early idiom and presents a significant commentary on the eternal struggle between the powers of light and darkness. As the curtain rises, Mlle Upanova, solo ballerina, symbolizes the dawn as she summons her dancers, the early hours, to her side in a series of graceful arabesques. The ballet chorus, in classic patterns, sur les pointes, follows her about the spacious hall until, in a lovely tableau, they kneel at the edge of a sunken pool. Then, as a nymph arising from the waves, Hyacinth Hippo emerges from the pool. Her hand-maidens circle about her in the vivacious faux pas, executed from the second position, portraying with tender nuances the languor of the day. Now, to the music's mode minor, a new corps de ballet interprets the twilight hours, and although there is still a gay abandon in the superb pirouettes of Elephanchine, there is a hint of something to come, a half-veiled, illusive mood of breathless desire. And it comes! Ben Ali Gator, maitre de ballet, sweeps in with his sinister band, heralding the sullen approach of the hours of the night. In a magnificent cherchez la femme, the chorus leaps about in bold double entendres, while their leader executes the brilliant triple entente with virile grace. The music's quickened tempo foretells the return of Hyacinth Hippo. She is timorous before Ben Ali Gator as he, entranced with her beauty, makes a passe-partout in her direction. Then, suddenly infatuated, she surrenders to him in the electric measures of the adagio as he lifts her triumphantly above his head in a swift demi-nelson. In the grand finale, the tout ensemble expresses the transcience of night and the victory of day in a spirited allons a buffalo. When we see what this talented troupe does to l'arte des danse in the true classic tradition, we can only marvel at what the future may hold. 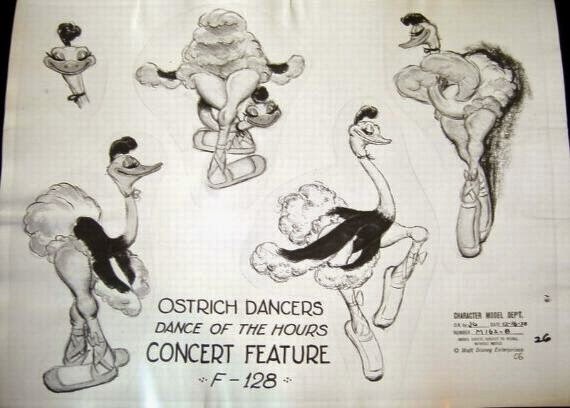 "The Dance of the Hours" by Ponchielli, one of Fantasia's most famous segments, introduced an unlikely ostrich named Mlle Upanova to the world of ballet. One of the funniest spots in Walt Disney's full-length Fantasia is the wild burlesquing of a ballet, done to the music of "The Dance of the Hours" by Ponchielli. The "prima ballerina" in this irreverent kidding of the dance is Mlle Upanova. Pronounce her name slowly and you'll get it. On the screen, you'll see her as coy, winsome ostrich with feet like canal boats, a black velvet ribbon tied around her long neck, wearing a costume of her own plumes. Such crazy goings-on when the Mlle really gets started with a chorus of her sisters happen only in the delirious designs of Walt Disney. 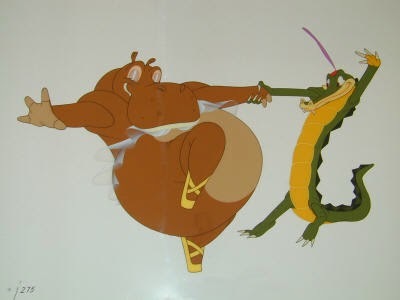 Mlle Upanova is assisted in her satire by Hyacinth Hippo, whose name is a clue to her rattle-brain character; by Ben All Gater and his pals, who are the villains; and by a chorus of "beef trust" elephants who finally wreck the place. The ballet as an art, of course, is no doubt here to stay. 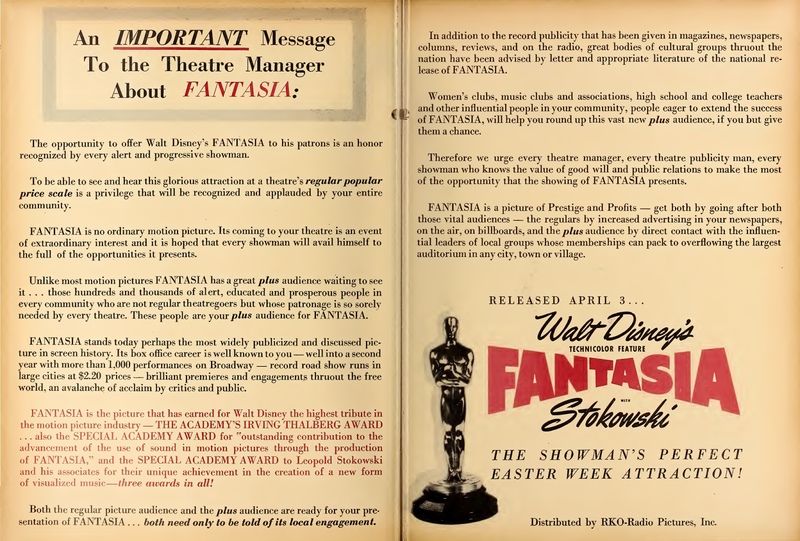 But after Fantasia, which is released by RKO Radio, there will be many people who never again will be able to watch toe-dancing without thinking of Mlle. Upanova, the side-splitting ostrich diva drawn by Disney.